A picture of contentment – For the fainthearted . . .
A favourite moment in Lord of the Rings, that book beloved of pubescent boys, is Strider the ranger sitting in the shadows in the Prancing Pony Inn at Bree. It is not that Strider goes on to be revealed as Aragorn, king of Gondor, nor that he is a heroic swordsman and extraordinary fighter, nor that he is a natural leader who assumes command of the group who will save Middle Earth from conquest by the Dark Lord; it is that he is content with his tankard of ale and a quiet corner in a pub by himself. 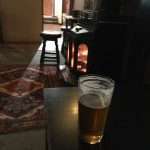 There are few more inviting prospects when by oneself than a pint of bitter and a tranquil room in which to sit by the fire. Aspiring at one time to be a writer and to retreat to a rural corner somewhere in the French Midi, there was a hope to adjourn business each evening and to walk to the cafe in the village square and to enjoy a glass of pastis in the warmth of the evening. It would have been a silent retreat, a time to contemplate the beauty of the landscape and the ancient stone buildings surrounding the square. It would have been a moment to listen to the laughter of men sat at the bar at the end of the working day; it would have been to hear the voices of moped riding youths, gathered in the cafe to play pool; it would have been to allow the sound of the television news to pass without notice. The glass of pastis finished, coins would have been left on the table, and there would have been the gentle amble home. Walking to the postbox on a sharp January evening, Orion and the Great Bear were prominent in the sky, a half moon cast light on the unlit road. Reaching the green, there was an inclination to walk to the village pub, which might or might not be open (in a pub in Ashburton in Devon last summer, an attempt to buy a second glass of beer at quarter past five in the afternoon brought a sharp retort from the bartender that last orders were at five o’clock on a Sunday). There were no external lights, but peering through the window, the fire was glowing brightly. Going in the side door, there was a notice at the bar, “Ring Gong 4 Service.” A single stroke of the brass gong brought a genie-like appearance of the landlord, seemingly from nowhere. 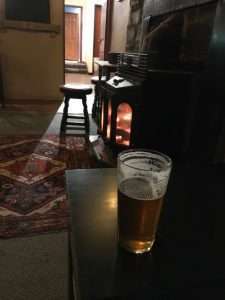 The beer was pulled and retiring to a seat in the corner of the empty room, there was a sense of peace and contentment, and a feeling sorry for Strider who became Aragorn, in our village there are no orcs or trolls to be faced. Jeepers man, Bitter !. I don’t imbibe but back when I did I wouldn’t drink that stuff if you paid me. I was at a football match last night where only lager or cider were on offer. The man with me, a real ale affionado, said he would prefer water; for him, it was a pint of bitter or nothing at all.